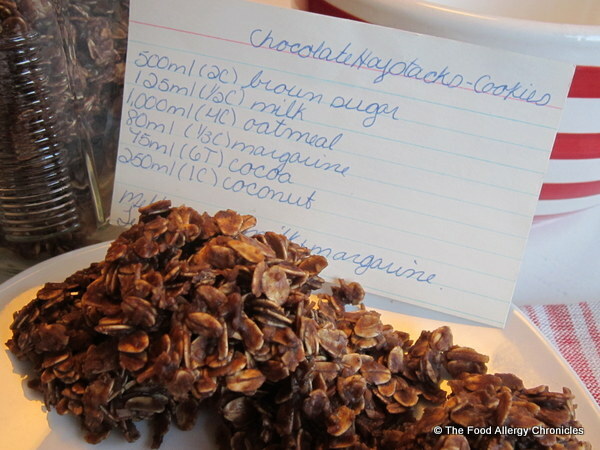 Posted on February 8, 2013 by Susan H.
I stumbled upon this handwritten recipe (written by me as a teenager) for my favourite childhood bake sale treat…Chocolate Haystacks. With Valentine’s Day just around the corner…I thought this chocolatey treat, filled with whole oats, coconut and rich cocoa, would be the perfect sweet indulgence to adapt for the boys. I was right…they loved them! 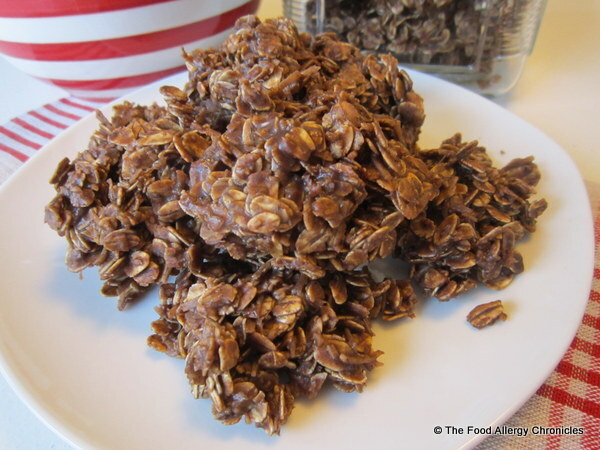 I have no idea where the original version of this recipe came from…more than likely, I asked the mother of the child who brought in the Chocolate Haystacks for the bake sale. Yes, even at such a young age I was drawn to recipes…I was and still do, ask anyone for a recipe if the dish is deemed to be delish! Simple to make with no baking required…just measure, boil, mix and stir! 1) Butter…Earth Balance Buttery Vegan Sticks (for a soy free version substitute Earth Balance Soy Free Natural Buttery Spread. 3) Cocoa…just make sure that the cocoa powder you use is dairy/peanut/tree nut free if you have these food allergies. 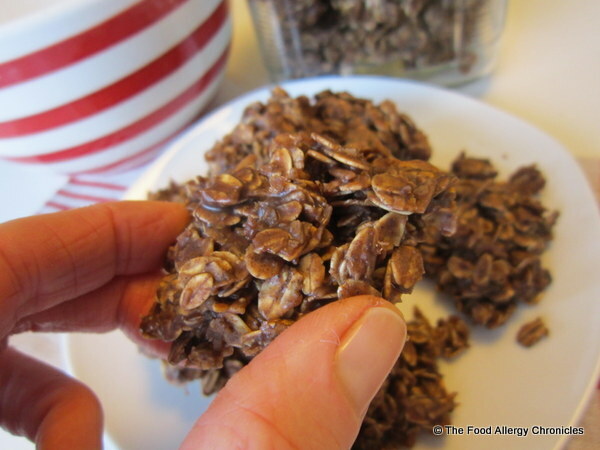 Always check all ingredient lists and allergy alert warnings no matter how familiar a product seems to you. In a medium saucepan, melt sugar and choice of Earth Balance. Mmmmm…just how I remembered them to be…delish! Do you have a childhood favourite recipe you have adapted for your children to enjoy? Will you be baking any allergy friendly treats for Valentine’s Day? P.S. Hope you are all weathering the storm that has hit Southern Ontario…as I sit here looking out my front window, it is a ‘white out’! How bad is it where you are? This entry was posted in allergies, baking, cookies, dairy free, egg free, multiple food allergies, oats, peanut/tree nut free, soy free, Valentines and tagged Dairy Egg Soy and Peanut/Tree Nut Free Chocolate Haystacks, Earth Balance Soy Free Natural Buttery Spread, Earth Balance Vegan Buttery Vegan Sticks, Natur-a Rice Beverage, Natur-a Soy Beverage by Susan H.. Bookmark the permalink.